Last week, Google rolled out significant changes to the way search results pages appeared for certain queries that had definite answers. The new format provides OneBox-styled answers, but without any accompanying organic search results. Today, a similar format has been spotted for product-related searches, with one major change: the first results page now shows shopping ads, paid search ads, and one small OneBox-type informational result, but no organic search results! Understandably, the initial news, which was shared by Twitter user Martin Macdonald, irritated a few webmasters and SEOs, who relied on traffic from search queries such as ‘time in…’ or ‘convert km to…’. The new findings, however, worried more than a handful in the industry. Cries of “Google is killing SEO”, and “SEO is dead” started echoing on social media. After all, if Google could kill off organic search results completely for a product search query on the first page, what hope was there for SEO? Looking at the details in the image above does give some relief to concerned SEO professionals though. 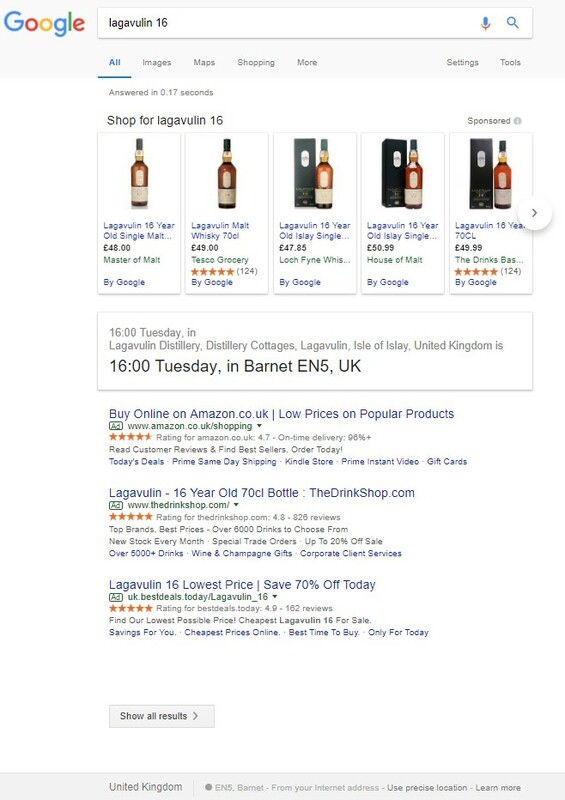 For the query “lagavulin 16”, Google seems to be currently misunderstanding the query intent. It thinks that the user is searching for the time at Lagavulin’s distillery, rather than delivering results for Lagavulin’s 16-year-old whiskey. Google is likely to soon fix that ? But this doesn’t alter the challenge that most organic search marketers will likely face in the coming months. Google is changing organic search to deliver more unified, user-centric results in the form of single answers on any device (just like they do for voice search results on mobile and home virtual assistants). Navigational queries tend to have fairly obvious user intent, so in such a case Google would be quite justified in presenting a single organic search result. After all, if a visitor searches for ‘www accuracast com’ they definitely want to be taken to this website. They haven’t yet done so, but SERPs for navigational queries are likely to get updated to present a single website and a bunch of ads from competitors above it. Informational queries currently seem to be flux. Where Google can give a definite answer, they are more likely to improve their user experience by giving that answer right in the search results page and removing the burden of choice. Where users are likely to want to browse through a number of sites, Google is more likely to present a variety of organic search results. Transactional queries are where the real money lies. It would be in Google’s financial interests to deliver mostly, or only, paid search results here. They risk alienating users, though, if all they show are ads. What’s more likely to happen here is a continual transition, where all transactional results (buy pages) are in the form of ads, and most organic results are informational – giving users more in-depth information, reviews, comparisons on a product, how to guides, etc., but not taking them direct to the buy page. By doing so, Google steadily sculpts user behaviour so that when a user is looking to make a purchase, they are familiar with automatically clicking on paid search results. Diversify beyond just organic search and paid search.